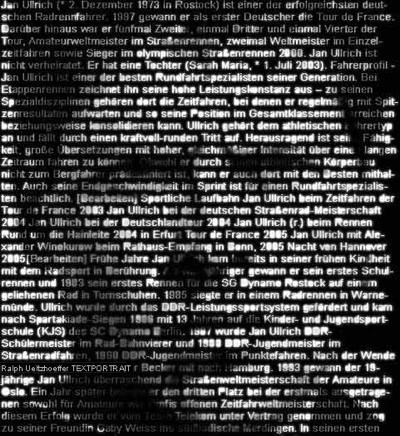 Textportrait as visual display is inseparably assembled out of text (internet) and photos and is therewith bound to a readable portrait. The typeface white on black relates to the DOS input mode (visually). Also see Barack Obama’s textportrait from a current exhibition. Art, at times, takes a pause to think about. The word drugs appears twice in Jan’s textportrait.